As a major history nerd, this jacket was one of those things I was instantly drawn to. I loved the vintage military inspired feel, the olive color, the ornate buttons, everything. It was one of those things that I would strategically plan outfits around. I called it my non jacket jacket since it was softer and felt more like wearing a sweatshirt. It quickly became part of my winter "uniform", which consisted of black pants, a gray and black silk tank, and black heeled boots with a zip up the back, and is an outfit I still look forward to wearing once the seasons change and the temperatures begin to drop. Over the years I have tried to shake things up but my favorite pairings always seem to be the more simple ones that don't draw attention away from what is possibly my all time favorite Rag and Bone purchase. This time I paired it with a cream colored Marc by Marc Jacobs shirt that I scooped up on sale at Century 21 a very long time ago, basic black pants, and ankle boots. Tell me, what's the most loved item in your closet? Oh I really like this fabric and the buttons! Very cute. I've been on the hunt for a great army jacket for quite some time - I love that one you have because it's totally work appropriate too!! Gorgeous jacket! Looks stunning on you! The fav item in my wardrobe is a vintage Chanel! Loving that jacket and your triangle ring! So cute! Love this jacket!! 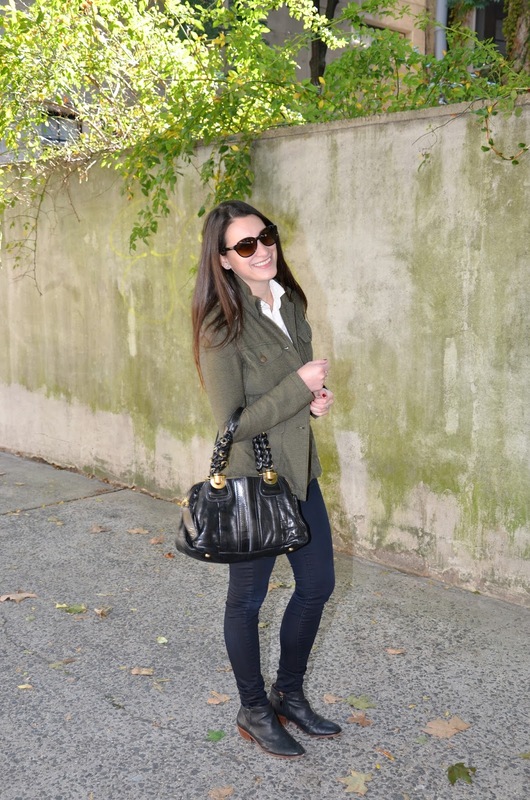 Definitely obsessed with military inspired pieces for fall! This jacket is so versatile too! Love that jacket! I feel like I really need a military jacket because they look so good with so many things. May need to try to find one this fall!